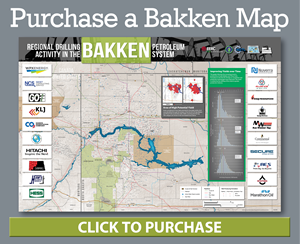 The 2015 Regional Drilling Activity in the Bakken Petroleum System Map is now available. The 2-ft × 3-ft map displays regional drilling activity in the Bakken System in western North Dakota and adjacent portions of Montana and Saskatchewan. First launched in 2011, the map has been updated over the last several years. The initiation of this project allowed the EERC to accumulate a great degree of knowledge regarding the Bakken System through its oil and gas programs and illustrate where activity was occurring and the magnitude of that activity. Designed and produced by the Energy & Environmental Research Center (ERC), in partnership with U.S. Department of Energy National Energy Technology Laboratory, the North Dakota Department of Mineral Resources, the North Dakota Petroleum Council, and support from 20 industry sponsors, the Bakken map has become a staple amongst the oil and gas industry and has proved to be a valuable resource for those with a stake in North Dakota’s oil boom. Purchase your copy online today at www.ndoil.org/?id=288.